Despite fears and foes, let’s sail confidently on to brighter days. 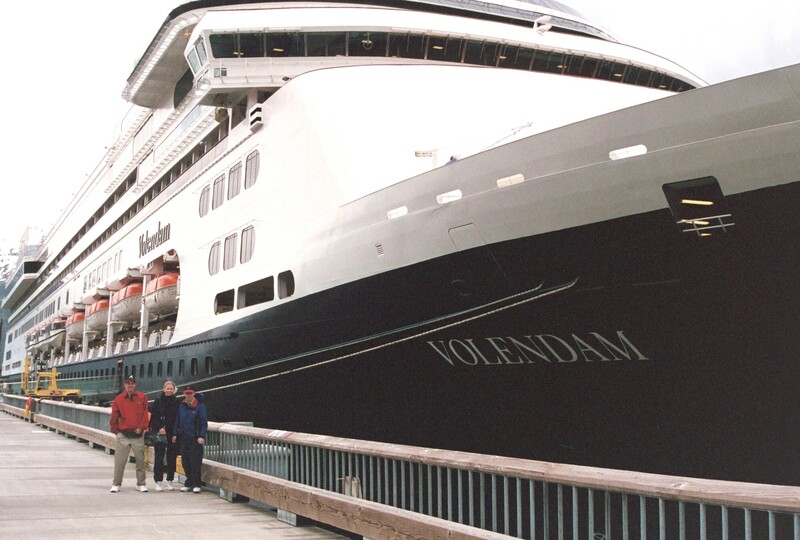 That’s Drew, Matt and me about to board the Volendam in Alaska, June 2000. Our new year is nearly two months gone, and many who made resolutions may have already abandoned them or altered them to fit reality. Still, it is never too late to keep reaching upward to higher aspirations for ourselves, our countries and our world. And it’s never too early. I’ve often written here about how I avoid watching the news. I’m not trying to hide from reality, but I dislike the way breaking stories are sensationalized to draw in viewers for the 24/7 schedules they must fill in this new age of continual electronic stimulation. Even worse, old tragedies and sorrows seem never to die; they keep being revisited, second-guessed and milked for whatever commercial value they may hold for media dependent on an audience to draw revenue. This leaves many heartwarming stories of everyday heroes and victories untold. We need to seek and create those stories ourselves, celebrating the good we find in the beauty of daily life. Have you ever marveled at how brief a time it takes to destroy what took years to build? Such destruction isn’t confined to warfare, either; earthquakes, hurricanes, deforestation and planned demolition, among many other events, all take staggering tolls on the works of both nature and humans. The lesson here speaks of the necessity for patience, fortitude, adaptability and purpose to ensure that life will go on in spite of continual calamities. Planting tiny seedlings that will grow into enormous trees long after we are there to see it happen, or sending small donations to people who are struggling locally and abroad, or reaching out in friendship to people who are different from us: all these actions, and many more, are acts of faith by which we seek a newer world. Thank you, Misifusa! I am so happy to see you here. Here, here Julia. Well said. I do hope the little things I do make a difference ’cause I never have made a big impact anywhere so far as I know. Praying for a wonderful future for you and your sweet family. Love you. Good advice. Here in Seattle we have Fox news non cable. It is one “Breaking news flash” every few minutes. Very annoying. Actually I have listened to little news the last two weeks on the East coast. Probably best to turn it all off. If it bleeds it leads. Jamie Oliver food critic has an interesting take on that. Sadly, my NY resolution to eat more bacon has gone by the wayside. My daughter in law in NYC is a vegan and I have actually been eating kind of healthy the last week. Trying to get back into it this week. Wish me luck. Michael, I find that NPR is much less annoying as a news source. It may not be unbiased (what news really is?) but it’s at least it’s calm and civil, and mostly commercial-free. Even in the commentary, you never hear people talking over one another or being rude to each other. They got a major demerit from me when they dismissed Juan Williams, but other than that. I have to say they’re about the only news I can tolerate for very long. Never heard Jamie Oliver’s take on that; I’ll have to look for it. Interesting that a food critic would comment on that, though surely everyone notices it. I think it’s probably a good thing you didn’t eat much bacon. As much as I love dark crispy bacon with eggs, I rarely eat it because of the nitrites in it– and when I do, I make sure to purchase the dietary equivalent of “carbon offsets” by eating Vitamin C to go with it. Years ago while I worked at the UT Medical School, I read in one of their employee newsletters that having a fresh source of Vitamin C could help counteract the carcinogenic byproducts of nitrites in the digestive system. Sounded good to me, so I’ve done that ever since. I’d advise sticking with eating healthy. It actually gets easier to do, since there are so many delicious and relatively healthy alternatives. As for vegetarian bacon– ask Alys how I feel about THAT! 😀 While they were with us, I filibustered our breakfast simply by reading the lengthy ingredients list of the vegetarian bacon Jeff bought for them. But aside from the ingredients list, it just looked so…unnatural! 😀 Tasted like potato chips, to me. What a wonderful post, Julia. “The lesson here speaks of the necessity for patience, fortitude, adaptability and purpose to ensure that life will go on in spite of continual calamities.” This was my favorite statement. If we trust that God is in charge and God doesn’t make mistakes, then we must know that everything that happens is in Divine order. I do my best everyday to be a good steward and I’m the only one I can control. Life will go on and the earth will go on in spite of us. Hopefully with our help. It’s Pollyanna but I have such faith in that Creator of all. We just never see the whole picture. I put my focus on the places you are, fortitude, adaptability and love. This morning my SIL called upset. She had been watching too much news and it had made her tense and irritable. Then she called her daughter and spread the infection. Her daughter, my niece, hung up on her. I suggested a diet of happy thoughts and viewing. Maybe taking herself to lunch or doing something creative. Change your focus, change your life. I know I’m off the wall but it feels so much better here. 🙂 Giant hugs. Marlene, I don’t think you’re off the wall at all. I totally agree with you. There simply is no point in fretting over what is completely beyond our control; it not only fails to improve anything, but it keeps us from doing the very real and important things that are within our grasp. As P. J. O’Rourke has said, “Everybody wants to save the earth; nobody wants to help Mom do the dishes.” (I just love O’Rourke; like Dave Barry, he helps me to laugh at what might make me want to pull my hair out.) I think the essence of faith lies in letting go of our need to control everything, and trusting that God knows best and will always have the final say. This poses quite a challenge, as many of us who are drawn to faith are also activist types who want to make a difference and make things better here on earth. Which we all are called to do, but judging from the teachings of Jesus, our role in that regard is a much more humble one than we sometimes want to think. Ironically, there is much power in such humility — “the meek shall inherit the earth.” A lovely thought, even though it’s hard to see that happening sometimes. I’ve always thought that the best way to make things better on the earth is to be better. I am the only person I can control. So I take steps to be kind, thoughtful, nurturing, non-judgmental, and open. I like the O’Rourke saying too. I’ll have to look him up. Very much like the Buddhist answer to the question of how to reach enlightenment. You chop wood and carry water. I believe in Divine Order. God is always in control and things happen the way they should. We just don’t always understand. It’s hard to watch others struggle. It is hard, isn’t it? Partly because we know how hard it is to struggle ourselves. I think Matt might have learned more independence if people were not always inclined to do things for him. The part about chopping wood and carrying water reminds me of the “wax on, wax off” exercises Mr. Miyagi told Daniel to do in The Karate Kid. I hope your travel day went well. I find that I don’t sleep well the night before a busy day; ironically, that’s probably when I most need the sleep! Re: seeing the holiness of everyday life — the quote in this post is for you today! Thanks for the quote , Julia. 😊 I did not sleep one wink the night before my flight.. Once I got here, made up for it. That sounds exactly like something I would do. Just make sure you do catch up…they say there is no such thing as catching up on missed sleep, but I did learn the hard way many years ago never to go very long without at least a little bit. Happy weekend! This need not be ominously cryptic; it could foresee interesting phrases by Owen Denton. Eric, I’m sure Owen will come up with some zingers– not that I will know about them. Sadly, I hardly know my father’s namesake. I have spent perhaps a cumulative total of 12 hours with him since his birth nearly 20 months ago, and I don’t imagine that will increase anytime soon, if ever. However, you make a good point about words awaiting a voice. One of the best sermons I ever heard was when Harold Hazelip briefly described the history that took place in some year in the late 1800’s — I have forgotten which year — and then added “but the really big news that year would not become known for some time: it was the babies being born.” He then went through a list of amazing, world-changing people in a variety of fields, all of whom were born in that seemingly less monumental year. Sheila, I am not surprised that they wanted you to come back! A lot of successful people end up doing that, especially with a job that was part of their lives for years. I know you will spread your own unique brand of joy wherever you go, and I love to think of you filling in as long as you are able. 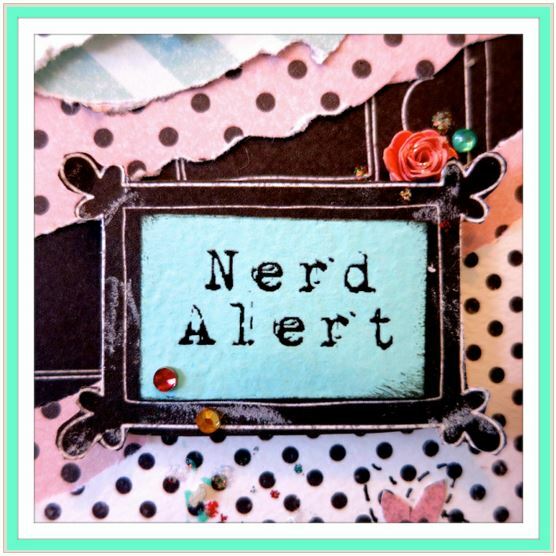 Hope you do get to your “tin condo” soon — I would imagine that those weeks away probably passed fairly quickly, with all that has gone on, but it’s no doubt time for a break! Thanks so, so much for keeping us in your prayers. I so appreciate your steadfast presence, encouragement and friendship! I’m struggling a bit with both, lately. Still, I’m going to forge out into new activities, because I figure that God can’t steer me if I’m not moving (picture a sailboat). … watching for other boaters, and lighthouses, of coarse! Thank you again for providing excellent motivation! “Nothing we can do can change the past, but everything we do changes the future.” LOVE IT!!! This is my new mantra. Thanks once again. Thanks, I have always loved it too! In fact, I’ve had it hanging on my fridge and then my wall for many years. I’m glad you share my appreciation of it. Ashleigh has come up with some real zingers. Well you know, I love that quote. You always seem to find one, I’ve never heard before, but resonates strongly. Is that a Librarian trick? teehee. Your Canadian TV sounds a lot like our public TV news, which would be my preference if I did watch. I fear that “just the facts, ma’am” has been replaced by “just the hype, ma’am” — I can remember Walter Cronkite (whom my Daddy used to jokingly call “Uncle Walter”) and I don’t remember him ever getting hysterical. When it comes to the news, boring is good, in my opinion. It’s easy to get totally discouraged about the fate of the world, especially when many of those already running it (or in danger of running it) seem so dishonest, self-serving and/or downright off-balance. But since there is nothing much I can do about it personally, I try to do what little I can, and keep focused elsewhere to stay grateful for every minute of the abundance we are still blessed to enjoy. Long ago I heard the old saying about how to handle negative or harmful thoughts; “we might not being able to keep a bird from landing on our heads, but we don’t have to let one make a nest there.” Pretty good policy, I think. I LOVE that saying J, I’m very drawn to birds and the metaphors they bring to everyday life. We can only hope so. I’m trying not to think about it too much. In NYC they have these bacon-cheese -egg sandwiches on a soft kaiser roll that is grilled. I could live off these. Sort of a haute-cuisine Egg Mcmuffin, but they are amazing. Now I can’t remember what Jamie said- it is in his food documentary talk that I saw on Net flix. Is Drew still at Emery? I wonder if he knows George Stone who is in the spiritual care department there. Michael, maybe it’s a female thing, but I have never liked breakfast sandwiches as much as Jeff and the boys do. Give me a platter of scrambled eggs (firm, with cheddar cheese) and hash browns every time. A croissant or some whole wheat toast (dry) with preserves on the side, and of course, a kettle of tea. Some really dark, crispy bacon would be impossible to resist, so feel free to keep it hidden. You guys can have all the sandwiches. Although, I must admit that NYC seems to me to be the sandwich capital of the world. I had my first hot pastrami there in 1972 and have never yet tasted anything equal to it. Yes, Drew is still at Emory, but is supposed to be graduating soon (keep your fingers crossed) – after 10 years there, an M Div and now a PhD it’s way past time for him to get out into the real world!!! Although to be fair, he has been working all along, so that may be why it took him longer to finish, although I think the main reason starts with G and ends with Y and has RAD in the middle! 😀 I will try to remember to ask him if he knows George Stone. I think since Drew finished seminary he has been mostly in the history department, but he probably knows a lot of people in theology there. Actually the NPR constant refugee crisis extravaganza is kind of depressing. Sometimes I have to go for the local drivel. Dave Barry does give some comic relief and we have a local columnist at the Seattle times who also has a humorous take. Well, yes, the actual content of the stories is often upsetting, but at least they don’t try to go all dramatic and make it even worse. Is Dave Barry on TV as a commentator? If so, I might tune in. I totally love his annual year-end review of the previous 12 months. The Onion is good too, although sometimes the profanity gets to be too extensive for my taste. I haven’t read it much in recent years, but they have come up with some great stories, including the recent one about President Obama’s supposed nomination to the Supreme Court, which I heard someone read aloud on the radio. It’s so therapeutic just to laugh sometimes, even when the topic is really no laughing matter. I think he is from Seattle and used to have a column in the Sea Times. Right, not too much drama on NPR. When in Atlanta I became reacquainted with a famous children’s book – centered in Seattle and based on actual events though the animal in question is n ow known as the Freemont troll which lives under the Aurora bridge. The book is ” The wheedle on the Needle.” You can visit the troll if you get to Seattle. It pretty much lives under the bridge now.Except at night when it goes hunting for little ones who make the mistake of not minding their parents. Portlandia has some funny stuff about the Northwest although I just could not get into it. The free range chicken episode is hilarious and also the politically correct Femininst bookstore takes that do not allow any pictures of males in the store. I’m embarrassed to say that I never heard of that book, but it sounds charming. Interesting that you were able to reconnect with it in almost the exact opposite corner of the country. I’ve never seen Portlandia although just the scenes you describe of it sound hilarious. I might have to check it out sometime. I can always use some therapeutic laughter. I’m so out of the loop that I never even saw Seinfeld (except snippets of it while the guys were watching) let alone any of the funny TV shows that came after it. It was five years ago today when the earth quake struck Japan. We were in Hawaii living on Kaneohe Bay off Puamohalla street. A scary evening as they evacuated the street below us next to the Bay. We were a block up. Some people in the house next to us set up their boat in the front yard to do what I am not exactly sure. The hospital was on alert and the supervisors had to report to the hospital. this led to the resignation of my boss at the time who had a young family and his wife was very distraught when he had to leave her and the kids and report to the hospital. Justifiably so. We moved our car from the apartment building two blocks up the road as many in the building did. We were on the second floor of the apartment and had a good view of the bay. Not too worried, but we were afraid to walk down to the bay and were told not to. I remember the panicked fear of the unknown and I envisioned the thirty foot wave tearing down the bay toward of us. Of course all of this caused little but a ripple- although on the Big Island some boat houses were tossed about. Still it was a little terrifying. By eight pm we got the all clear. Of course over 1000 died in Sendai alone and children watched in horror as their parents were swept out to sea. Michael, I had not realized (or maybe had forgotten) that you were in Hawaii as recently as then. The threat of a tsunami is very real to anyone who has ever lived through one; for many of us, the idea of it is too remote to grasp. While we were in Hawaii, I only recall school being cancelled one day the entire time, and that was because of an earthquake in the Pacific that could have resulted in a tsunami. Nothing at all happened, and a lot of us were rather scornful of the decision to call school off. I thought of that in 2004 when the devastating tsunami killed hundreds of thousands of people in and around the Indian Ocean– and of course, again in 2011. Sometimes we laugh or criticize out of our own ignorance, and live to see that we were mistaken. I cannot imagine how horrifying it would be to be literally torn from loved ones by a fatal storm. 2011 was my year in the sun. There was a neat interview of Pat Conroy who recently passed- on NPR and how when he was at the Citadel and on a perpetually losing basketball with an abusive coach. He said, “you really never learn anything from winning, but when you lose you can learn some valuable life lessons. There is a deeper message with losing and at some point you learn how to get up again after being knocked down. Losing has a deeper music. It is like that Steely Dan song- “I want a sign when I lose. Call me deacon blues.”This might explain the actions of some recent famous athletes who seem unable to learn this lesson. Our little beach house is built out on a mile wide spit. In the event of a major tsunami, which is overdue, we would need to evacuate. At this time, the town is building a 45 foot high evacuation tower at the local high school. The community is dotted with evacuation Tsunami signs that show escape routes and they a tsunami warning signal that they operated every month or so. Mr. Rogers was so ahead of his time. I often think of him when I wear my red cardigan out on the town. As I write my little children’s book- not easy as you mentioned- a sister book for Wheedle on the needle- I picture scenes in my head. I suppose that is the second step-finding a good illustrator. Did you self publish your book on your own? A good editor would also be helpful- I imagine. So many writers and so little time. Good podcast on Story corp about a young man and his encounter with Piers Anthony- fantasy writer. Great story. I think my younger son was into that genre. As far as losing goes I don’t know if you caught Cam Newton’s interview after his loss in the superbowl when he walked out like a spoiled child. He basically said- “I don’t like to lose and no one likes a loser.” Despicable. Our little place is actually a mile from the beach- but you can hear the surf most of the time. Hopefully, the Tsunami shelter will be done soon. Michael, I have never published my book at all. I have been reluctant to try self-publishing, and though I’ve had some helpful and mostly positive feedback from agents, it’s really too unusual a novel for anyone to want to take a chance on it. Yes, a good editor is essential, I think. Anyone who doubts that should read Go Set a Watchman, which was transformed to To Kill a Mockingbird with the help of some good professional editing. Not much doubt as to whether the editing was a good thing in that case. I didn’t see Cam Newton, nor even know who he was until all the news stories came out recently. I have some sympathy for anyone who has to bear the disappointment of losing in front of millions of people. Having said that, those who do it well are loved by their true fans. I will never forget the 1991 Atlanta Braves, who probably became more respected and admired by die-hard fans because of their heroic, exciting and ultimately losing effort in the World Series (game 3 of which we were lucky enough to see in person). A mile from the beach sounds good to me! The sounds of the surf are what I most crave. I hope the shelter is in place soon. Good read you today on the UR site.